(Above) KIM-1 6205 based computer circa 1976. Cost almost $800 adjusted for inflation. Update 2018: original title "Technology is Why the Jobs aren't Coming Back"
This was written circa 2010 and big changes mainly political has given workers some hope. Let's review the original. High paying jobs, in particular manufacturing, are never coming back in any large numbers. The government from Bristol to Washington has tried everything to change this and have failed. Sure we might get an occasional auto plant for something that amounts more to a relocation rather than new jobs costing over $500 million or more in corporate welfare for ever fewer jobs. What I call the Bristol effect has become national. In Alabama at a Coke bottling plant the filler line fills 12-ounce cans at a mind-boggling rate of 1700 cans per minute, and has only 1 employee. A Coke can manufacturer makes 3.6 million Coke cans per 12-hour shift and has only 18 employees. Even China the slave-labor capital of the world has reported losing manufacturing jobs. Part of this is due to rising cost and a higher standard of living for Chinese workers and other losses are due to shifting to even lower-wage countries such as Vietnam, but most of it is due to automation. The answer is technology that produces better and more important cheaper products at far lower cost. As a technology instructor myself I have far more sophisticated electronics in my home lab than NASA had during the Moon Landings and much of the Shuttle program. And I'm not alone by any means. What has changed all of this? The election of Donald Trump. This isn't about politics, my concern is industry, science, and technology. The rollback of punitive E.P.A. regulations and affordable energy are a game changer. Before one goes into a rage put your emotions aside and use some reason. I support reducing actual pollution through efficiency and technology. The World Health Organization rates America 2nd to Canada as the cleanest country in the industrial world for sulfur, particulates, etc. reductions. We are a hundred times cleaner at double the population and many times the energy use over say 1945. Affordable energy along with RECORD oil and gas production gives America a huge advantage. American energy is FAR cleaner than energy produced in China, India, Brazil, etc. Less pollution is GOOD for the environment. Affordable energy means we can afford to protect the environment, not government imposed depravation, rationing, and redistribution more designed to achieve political ends. I won't waste my time debating carbon dioxide and politicized science and fraud that surrounds the issue. Nuclear is the clear answer to reducing CO2 along with natural gas and fuel efficiency. I mean new reactor designs that can be online in a few years such as breeder reactors to recycle spent fuel rods, thorium reactors, etc. The same people so hysterical about CO2 also block the very technology that will solve the problem they claim to march for. This has never been about climate. Affordable energy due to plentiful supply and yes rational government regulation creates jobs. These are what I call auxiliary jobs. Referring to the above aluminum cans is a good example. American aluminum as opposed to Chinese aluminum means jobs outside the aluminum can manufacturer. Workers will mine the ore (bauxite), process the ore, make the aluminum, produce the electricity used in the process, ship and move material, etc. creates jobs. So we have more jobs than produced at the soda can plant factory floor. There are scores of white collar and clerical jobs; maintenance and engineering jobs, and shipping and receiving jobs. Those again are auxiliary jobs and more important produce a living wage for those without often worthless advanced 4-year degrees. Jobs in industry are indeed coming back even though it isn't product assembly or production as such, but there will be some. Wisconsin will be making flat panel displays. (Taiwanese electronics manufacturer Foxconn Technology) The Element LCD monitor I'm using here has TV tuner input, HDMI, video, internal audio speakers, etc. for $95 at Wal-Mart. I discarded my old CRT (picture tube) type VGA monitor that cost hundreds years ago, has only a VGA input, and weighs about 30-40 lbs more than what my Element monitor does. See Nulife Glass Fiasco and Tons of Leaded Glass. 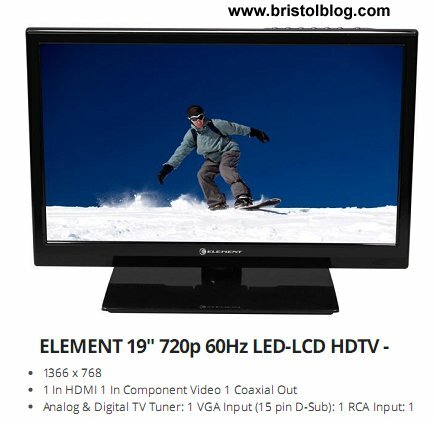 The new monitor uses a fraction of the energy and materials the older monitor used. The old monitor also has a lot of leaded glass - millions of tons of that glass is sitting around and is a big problem to dispose of. Best part is the Element monitor was assembled in South Carolina, uses less than 20% of the electricity the older monitor used. Being involved in technology for over 40 years I've witnessed mind boggling advancement. Items costing almost $800 (adjusted for inflation) in 1977 can buy a thousand times the speed and computing power for $40 today. Computer memory for the KIM-1 was going for $50 for 1K or 1024 bytes of static RAM. 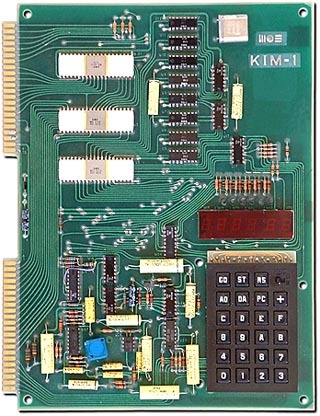 The KIM-1 had no power supply and used a calculator type display. 1024 bytes X 1000 is 1 megabytes. 1024 megabytes is 1 gigabyte. Most PCs today come with 4 gigabytes for about $50. The KIM-1 then went for $200 in 1977 was a marvel at the time. Hundreds of applications and several books were written on machine code programs for the KIM-1. Lack of advanced cheap hardware meant programming smart. Its 1mHz 6502 microprocessor was the basis for the more Advanced Commodore computers of the 1980s such as the Commodore-64 and VIC-20 both programmed in basic. Contrast the KIM-1 to a Raspberry Pi 3 today. Costing about $35 can operate as a low-end Linux computer. It has 1 gigabyte of memory and a 1 GHz processor. While not as powerful as advanced cell phones, it has more computing power than the Apollo moon lander computers. It can be programmed in Perl, C/C++, Python, Lua, or any other computer language out there today. It is open source meaning there's no copyright nonsense. It has audio out jack, HDMI video, 4 USB ports, and an ethernet port. 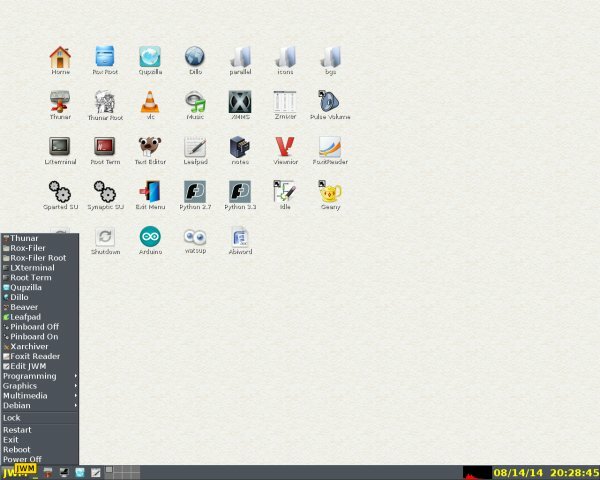 One can use the command line or any number of Linux desktops such as LXDE, Openbox, Fluxbox, JWM, etc. In the sense it operates the same as a personal computer to surf the web, word processor, etc. Most of my programs are based on "lite" or low resource software. More on that when I get to reusing old PCs. Debian on a PC or Raspberry Pi. Modern computer technology has another advantage - they use less materials and energy to manufacture, thus good for the environment without government sanctioned economic depravation in the name of Gaia. The Raspberry Pi is about the size of the KIM-1 keypad and high density modern integrated circuits reduces parts count, cost, and energy consumption. This more advanced computer used a fraction of the energy and materials of my old KIM-1. This is just on the hobby end. Industry has greatly advanced at the same pace. Programmable logic controllers (PLCs) and CNC machines, advanced computer controls are used in everything from aluminum can production to semiconductor production. There are scores of jobs available operating these devices that don't require a 4-year degree. In my view many new "Blue collar" jobs are not the old assembly line jobs of the past. They require more skills, better education, etc. but not a 4-year degree. They pay more than most junk liberal arts degrees. For example, www.glassdoor.com reports CNC Machinist Salaries from $21-$27 per hour or $40,000 to $50,000 a year plus benefits. Also consider manufacturing isn't located in high cost of living regions such as New York City or Los Angeles, but states such as Alabama or Texas. These states make a paycheck worth far more. Far too many college graduates end up in non-college jobs in particular with liberal arts. Payscale.com reports a typical call center job pays about half of a CNC job, certainly more than tending bar. These jobs are very unstable and have high turnover rates as companies constantly relocate seeking cheaper labor and corporate welfare. As noted in the New York Times the pay for liberal arts degree holders is appalling around $20,000 a year if they can even get a job. And that is after spending 4 years or more out of the labor force and often straddled with massive debt many can't pay off. It's like having a house payment without the house - no wonder so many still live at home. 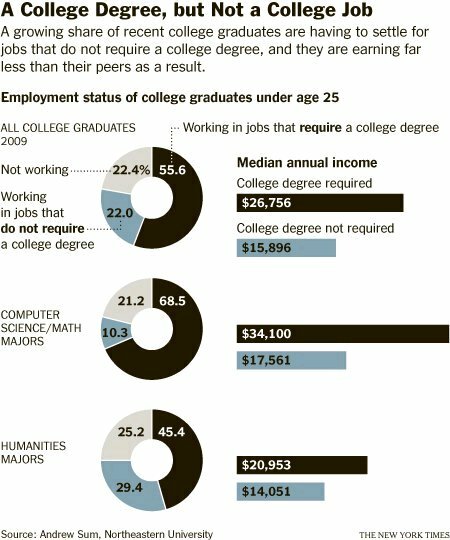 This misery is compounded by many companies demanding college degrees for non-college mostly low-paying white-collar jobs. So the real cost of a degree to land a $20,000 office job calls into question even getting such degrees. Sorry there's few job openings for social justice warriors. Also note there are scores of high-paying non-degree jobs in the energy production occupations. Note that in 2018 U.S. oil production has hit records (10 million plus barrels a day) and climbing! This is after years of fear-mongering by environmental socialists claiming we are running out of oil and gas - socialism now to redistribute dwindling resources! Gas production has also set records - all due to technology and scientific advancement. In the most recent WHO report on air pollution, the United States was listed as one of the countries with the cleanest air in the world...The WHO report is corroborated by a series of other such studies on air and water pollution. Rather than follow the time-tested practice used by the World Health Organization, which measures levels of disease-causing pollutants that get into people’s lungs, some have played a shell game, swapping a new measure of "pollution" based solely on emissions of carbon dioxide. This has led with advances in bio-technology with high yield crops. This enables modern technology based farming to feed the world while allowing millions of acres of low performing small farms to return to nature. Technology and affordable energy once again helps Nature. 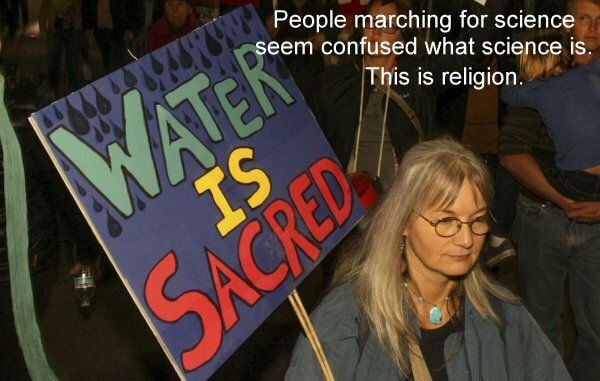 Religion has nothing to do with science or technology - it won't save the environment either. (Above) one of my Raspberry Pi computers connected to a number of circuits, an LCD display, etc. The system I use on the Raspberry Pi is Linux in particular Debian Linux. This is the same Linux used on personal computers minus the differences in machine code. In particular there are a group of electrical pins designed to be connected to external electronics circuits. 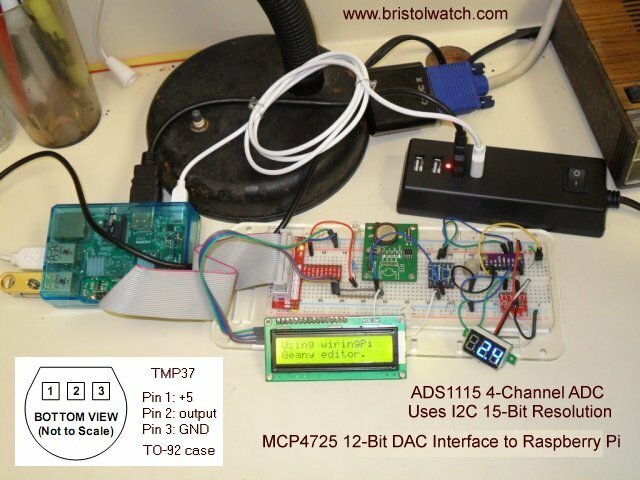 See the following for connecting various sensors to the Raspberry Pi. 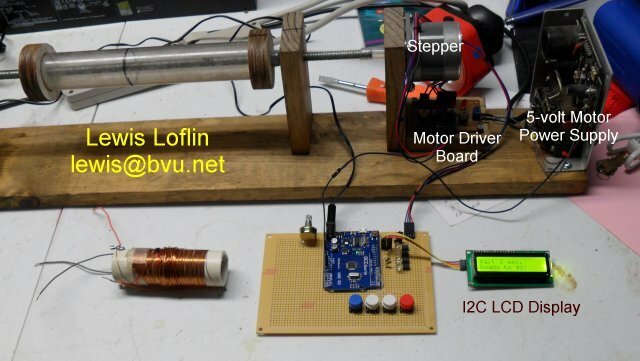 In this case the Arduino controller (less than $10) is in the center with an attached 2 line by 16 character IC2 based liquid crystal display ($4), a salvaged 5-volt power supply, salvaged stepper motor, and a home built stepper motor drive board. I could have used the Raspberry Pi and leave out the LCD display (it will work with the RPi) and use my Element computer monitor. 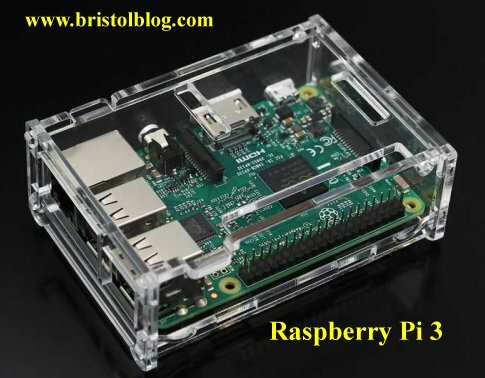 The Raspberry Pi can be used to program the Arduino. The point here is the availability of cheap surplus electrical and electronic parts - in particular on Ebay. 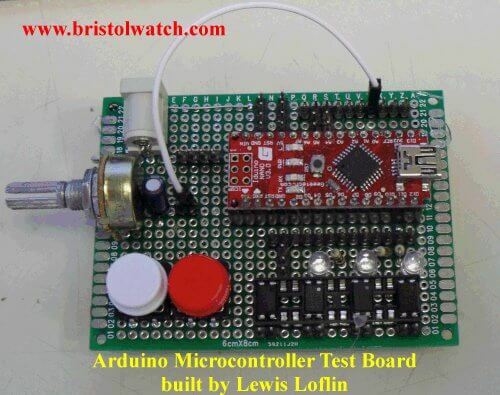 (Above) my home built Arduino Nano test board. 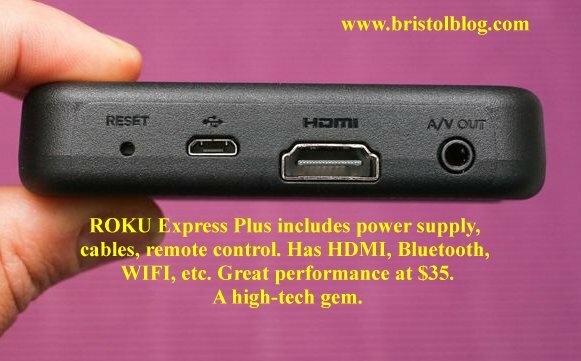 Modern technology such as my wireless Roku Express box is a fantastic value. Reuse Older Computers? You bet! (Above) part of my old computer collection. They all operate on either Windows XP or Linux. Most won't work with Windows 10. Sometimes for those of us with limited resources to reuse older technology. Millions of perfectly good computers are junked every year because they can't run Windows 10. 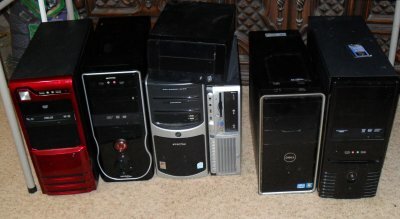 I have a number of older PCs. There is a number of issues one must be aware of. First question is hardware. Anything older than 20 years old will present problems. The BIOS determines what hardware can connect to the motherboard. 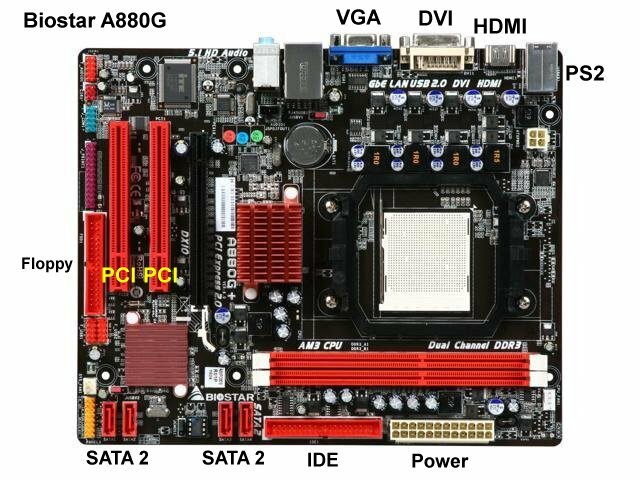 The motherboard is central - what will connect to the motherboard? CPU speed is obvious to processing power. Anything below 1GHz isn't worth the effort. I have one that runs at 800Mhz that will run old Windows 98/95 or obsolete Damn Small Linux. It hardly recognizes a CDROM. Memory is another issue, the more the better. In my view 1GB (1024 X 1 million) is minimum, 2GB plus is better. I do have one that operates on 512MB that works fine on Windows XP. They often have PS2 connectors for keyboards and a mouse. Some used a serial port mouse and a hardware printer port that I tap into to control external electronics. These are used in some industrial connections to CNC controls. Some even had a joystick game port. They could be on the back panel or mother board connections to a metal plate in the plug in card slots. I also want at least USB 2.0 not the old 1.0, which is OK for a keyboard or mouse, not a USB drive. Most mother boards have built in audio, video, and ethernet. Really old boards have separate plug in boards for those. Old boards have ISA connectors (long black) sometimes with PCI (usually white) connectors. For connecting hard drives and CDROMs and DVROMS they have either IDE connectors or SATA connections or both. Newest boards have dropped PS2, ISA, IDE, printer, game ports, serial, floppy drive and have perhaps 1 white PCI left for add-on hardware. Most have gone to faster USB 3.0 and have more USB ports in general. What I'm referring to here are desktops and towers, laptops have little hardware flexibility. There are PCI add on boards available for USB upgrades and for printer/serial ports for those mother boards that lack them. Because I have lots of surplus-salvage PC hardware that can fit almost anything, I need maximum flexibility. The more port and hardware connections the better. 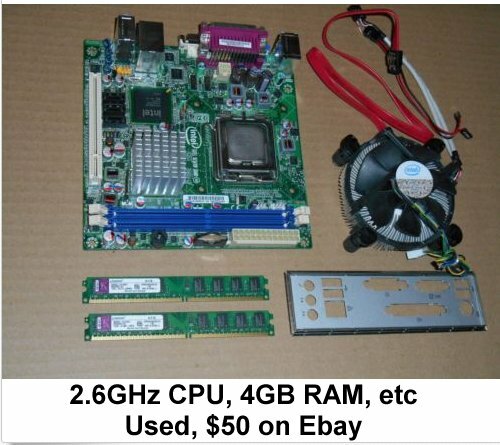 The above is a Biostar mother board I bought off Ebay for around $40 that included a 2.6GHz CPU, fan, and 2GB RAM. It even included the driver disk and back plate. It was ready to install in an empty case. Made circa 2010 it included hardware connections for almost anything. 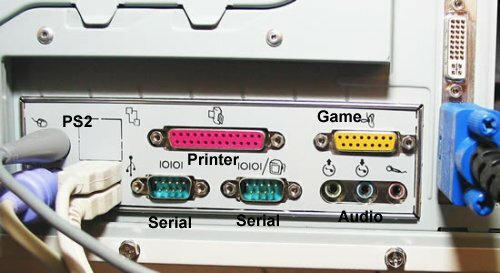 This included 2 PCI (red) connectors, IDE, SADA, printer port, serial, etc. While not the newest or greatest it works great on "lite" versions of Linux. The above board is also used like the Biostar but is missing some features. Only 1 PCI, no IDE which means many older hard drives and CDROMs will not work. Above are two of my "old" computers. 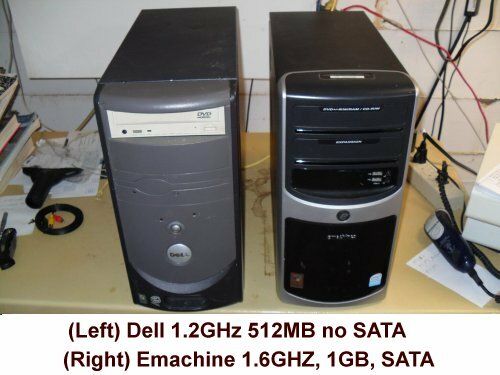 The Dell had a 1.2GHz CPU, 512K RAM, and IDE only for connections to hard drives and CDROMs. The Emachine is 1.6GHz CPU and I upgraded to 1GB RAM. More important it has both SATA and IDE connections for hard drives and CDROMs. It came with Windows XP, so did the Dell. Both run lite versions of 32-bit Linux. The Dell in particular ran slow when using Firefox or Chrome. Under Linux one has a choice of low resource but good web browsers. Qupzilla (a low power version of Firefox), Midori, and Opera are alternatives. Opera is also a good choice for Windows XP - fully functional but won't load down the system. Up to date IE, Firefox, and Chrome won't work on XP or even Windows 7. Both boards have printer ports, ethernet, serial, VGA video, etc. One option for older computers if they have SATA connections is a SSD or solid state drive. I'll address several issues here. SSDs are FAST and can make up for slow CPUs. A lot of people are chucking the older and slower IDE drives for SSDs. But there are piles of older IDE drives for often free. The downside perhaps is possible problems with reliability issues of SSDs. I have two both Sandisk I've used in older PCs with Linux. I've had no problems. Another point is technology versus the environment. 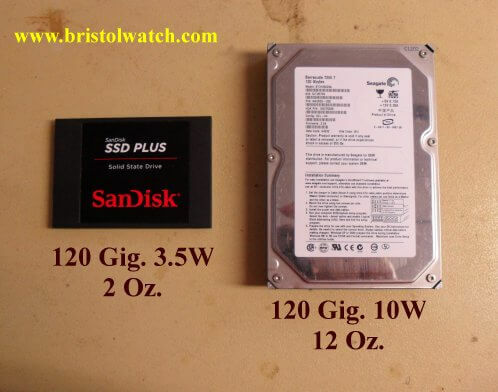 SSDs don't use rare earth metals such as neodymium. It isn't rare, but hard to find in minable deposits. China is the main producer with little priority for pollution. There are lakes of toxic waste from their mining process. The SSDs use less energy and materials than most of the older IDE drives. With advancement of technology the environment wins again. 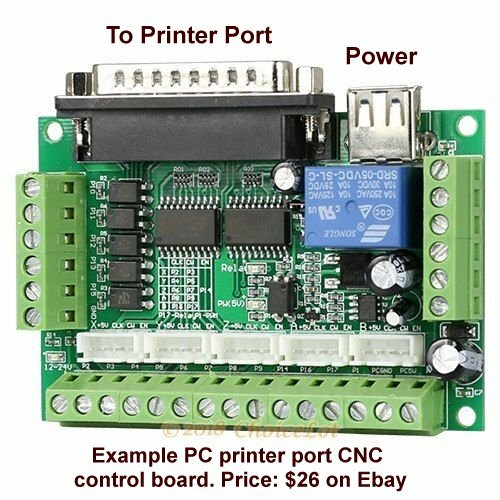 (ABOVE) Printer port based CNC control interface board. CNC or computer numeric controls are not only on factory floors, but in a private garage. Hobbyists and home engineers have built their own CNC machines to cut wood or metal parts. Control boards and parts are available at low cost on Ebay. 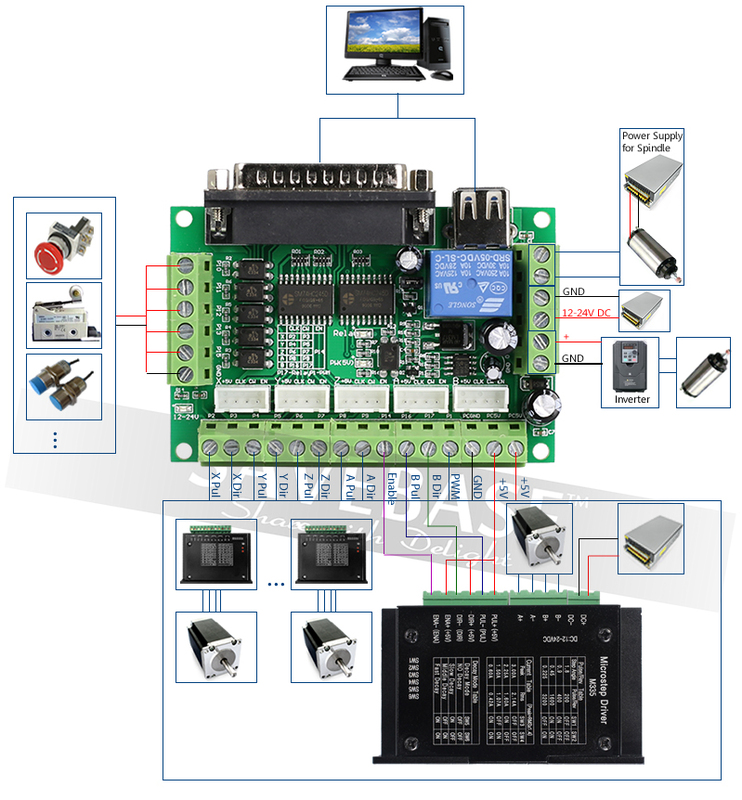 To understand the basic connections see the graphic CNC interface diagram. I'll close this out with 3D printers. Another technical game changer for hobbyists and Makers. They are getting better and cheaper every day. Industrial versions I think can print in metal or powdered ceramic. In summary technology has made products far cheaper while saving energy and resources. Technology makes energy affordable in both production and pollution control. We must push back against technophobia and the eco-pessimists. Liberty to innovate free from meddling by earth-centered religious nuts and disgruntled socialists are the only real threat to technology and innovation. See Live Linux Distro for Using Printer Port with Electronics. See my Hobby Electronics Website.